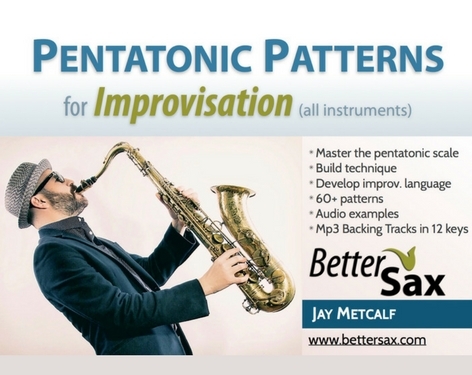 Need a gift idea for a saxophone player? Or maybe you’re a sax player and need a convenient way to drop some hints to your loved ones so you don’t get another ugly sweater this year. In this post I’ve put together a list of great gift ideas in all price ranges that will make any sax player very happy and help anyone shopping for a saxophone player get the right present. Click Below to watch the video version of this post. 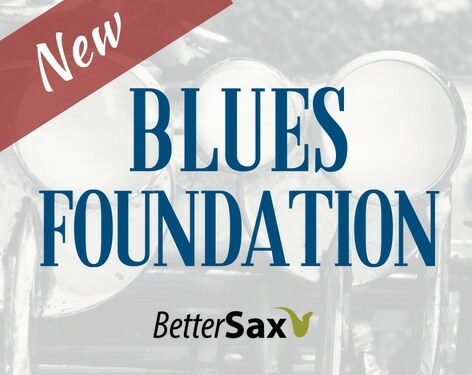 *Note that there are additional gift ideas for sax players in this text version you are reading. Just about all of these saxophone accessories we are going to discuss I own, and have been using for a long time. I bought them myself but if someone had given me any one of these things as a gift I would have been very happy and also pretty impressed with their gifting skills. 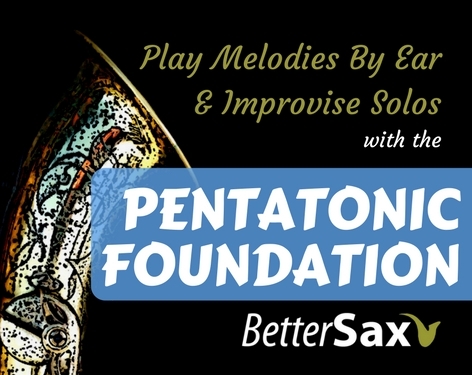 There are links for purchasing all of these items throughout this post to help you can make the special saxophone player in your life very happy. or you can just buy this stuff for yourself. That’s what I do. Also if you’ve got any good gift ideas that don’t get covered here, please put them in the comments below. I’m always looking for new saxophone accessories to try out and get a lot of great ideas from readers’/viewers’ comments. 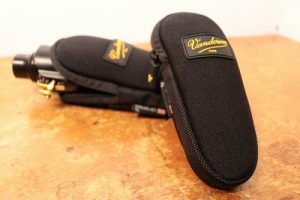 These neoprene mouthpiece pouches from Vandoren are great and should be in every sax player’s case. Mouthpieces need protection since the slightest imperfection can have an impact on how well they perform. 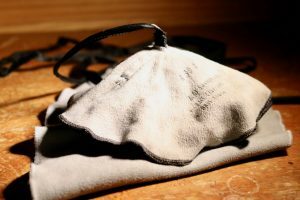 Sax players generally store their mouthpieces with the ligature and mouthpiece cap in place, so a pouch keeps the whole ensemble together nicely. The idea is to prevent it all from rolling around in the case and coming in contact with the other things residing in the accessory compartment. I have one for alto and one for tenor. They fit all my different mouthpiece and ligature combinations. I will be purchasing some more of these to store and transport secondary and backup mouthpieces. I have been through just about every type of saxophone swab out there and these microfiber and bamboo swabs made by BG France are by far my favorites. Since I have been using these (going on 10 years now) they have kept all my horns clean and dry on the inside. I’ve passed them through my horns several times a day, everyday, and they are still going very strong. An item like this needs to be built with high quality materials if you don’t want it to come apart over time. (This is what has happened with most of my other swabs). 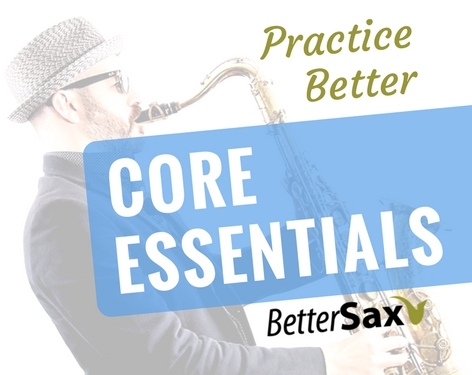 For the body swabs, it’s important to get the right model since the tenor version will get stuck if you attempt to pull it through an alto saxophone and the alto version won’t absorb all the moisture in the bell of a tenor. For the mouthpiece and neck the A31 swab works for all types and sizes of saxophones and mouthpieces. It’s important to have one body swab and one neck/mouthpiece swab. So for alto saxophone get the A30A body swab and for tenor saxophone get the A30T body swab as well as an A31 for the neck and mouthpiece. 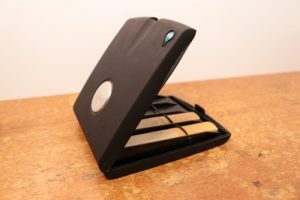 This reed case from D’addario holds up to 8 reeds. What’s nice is that it stores any type of reed from clarinet to baritone sax. It comes with a replaceable humidity control pack. I would recommend this case to woodwind doublers who need to have different types of reeds at the ready in one place. 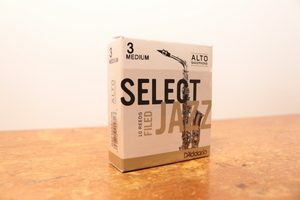 When I was working in pit orchestras and on cruise ships playing alto, tenor, and clarinet in the same performance, this would have been a convenient way to have all the reeds I needed at the ready in one package. I have recently upgraded my reed case to the Hygro Case by Vandoren. This is the first reed case I’ve ever owned that keeps my reeds humidified without them becoming all mouldy. There is an ingenious system of air circulation and a little sponge that maintains the humidity level in the case. It comes in two sizes. The HRC10 holds 6 of any Bb, Eb or alto clarinet and soprano or alto sax reeds. The HRC20 holds 6 of any bass clarinet and tenor or baritone sax reeds. Each of these cases are the same size on the outside. It’s inside that changes to accommodate the different size reeds. I have one of each and love them. It is possible to store smaller reeds in the larger version so if you just want to get one I would choose the HRC20 as it will cover all bases. All saxophonists need reeds. If you’re buying a gift though, it’s very important to know the strength and brand of reed the saxophone player uses. There are various systems across numerous brands for the strength and cut of reeds. Some use a system of numbers and others use words like soft, medium, hard etc. A number 3 reed from Vandoren may be very different from a number 3 from another manufacturer like D’addario. I suggest taking a peek inside the saxophonist’s case to find out what reeds they are using. Take careful note of the strength as well as other variables such as whether or not the reed is filed or unfiled. I’ve been using the Sax Holder saxophone harness for a couple years now and love it. Traditional neck straps place all the weight of the saxophone on the player’s neck and spine. This is not only uncomfortable but can also cause pain, discomfort and serious long term damage. This clever device transfers the weight of the saxophone to the shoulders with a unique three point system. I recommend the saxholder for all sax players especially those who play tenor and baritone saxophone. Check out my full review of the saXholder here. Every sax player needs a quality saxophone stand. The Auto-Grip Stand by Hercules is one of my favorites. This newer design is a pleasure to use and I can place both my alto and tenor saxophones on it with total peace of mind. When you place the instrument on the stand, the weight of the saxophone triggers a mechanism that grips the horn securely. The stand folds up nicely and although it is on the heavier side, that’s a reasonable trade off for the security. It’s possible to add pegs to this stand what will hold up to 2 additional instruments like a soprano saxophone and flute or clarinet. K&M is a company specializing in stands of all types and their Saxxy stand is a clever and attractive design. 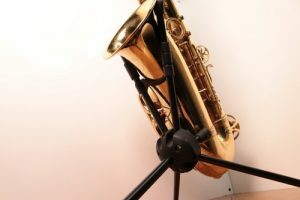 These minimalist and lightweight sax stands can be folded up easily and be stored in the bell of the saxophone while in the case. This stand is surprisingly stable and holds the saxophone quite securely. Unlike the Hercules stand, the Saxxy stand only works for one type of saxophone so you would need a seperate one for alto and tenor. Also, there is a tendency for the Saxxy stand to stay gripped to the bell of the saxophone when picked up. It’s not a big problem in the practice room, but on a gig, this would be a big distraction. I recommend this stand more for home use where you might want a more attractive stand and less so for working musicians where performance is critical. Here’s another great product made by JazzLab. I’ve been using the Sax Deflector for a few years now and it has become an absolutely essential piece of gear that I use on all gigs. It’s a simple device that attaches to the bell of your saxophone and literally deflects the sound of your instrument back to your ears. This allows me to hear myself much better when playing in live situations where there are lots of other loud sounds going on around me. The Sax Deflector works great in both acoustic playing situations and when playing with a microphone. 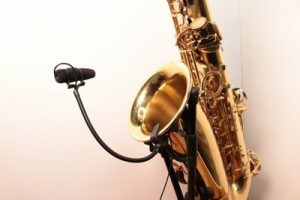 The hole in the Sax Deflector allows it to be used while playing into a microphone and a clip-on mic can simply be attached to either side of the bell and adjusted accordingly. The bell clip stays put when being used yet detaches very easily and the whole thing takes up very little room in my saxophone case. 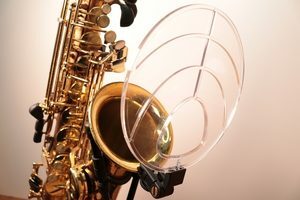 The Sax Deflector can be used for all types saxophones: alto, tenor, soprano and baritone. 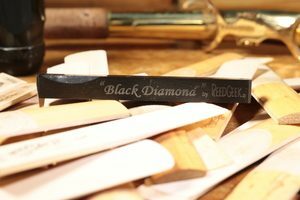 I discovered the ReedGeek reed adjuster during a particularly frustrating period of bad reeds. I had read very good reports about this device and was willing to try anything. Result: bad reed period over and never seen again. On the surface, the ReedGeek doesn’t look like anything special, but it is actually a very sophisticated tool built to great precision. In a matter of seconds I can now drastically improve the playability of all my reeds. 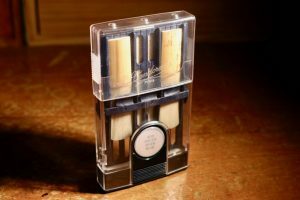 Daily usage increase the life of my reeds by weeks and with a bit of practice anyone can learn how to fine tune saxophone reeds to their personal preferences. My ReedGeek has paid for itself many times over in the 2+ years I’ve been using it. The ReedGeek is truly an exceptional tool and I consider it required equipment for any serious saxophone player. A quality music stand can really increase a musician’s quality of practice life. My favorite is the Manhasset music stand. It’s sturdy, easily adjustable and can hold a lot of stuff securely. It does not fold up and is not the sort of thing you would want to take with you to a rehearsal or performance. At home in the practice room though, it makes the perfect centerpiece for any studio. Any performing saxophone player will at some point, need a microphone. The PRO 35 by Audio Technica is a great entry level clip-on microphone. I used one of these (the preceding model AT-35) for many years and it does a great job. In the hands of a capable sound engineer, I have been quite happy with the sound of this mic. It’s well made and can stand up to the rigors of regular gigging. This is the mic I’ve upgraded to. It’s truly a professional piece of gear and reproduces the sound of my horn very accurately and naturally. I expect to get many years of use out of my D:vote clip-on sax mic. Recording yourself playing is extremely important for all saxophone players who want to improve. 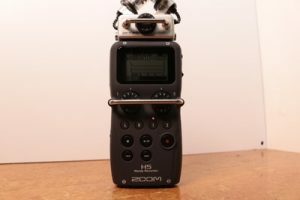 We have to critically listen back to what we sound like often and the Zoom H5 makes it easy to get a great sound while recording yourself anywhere you are. I use this in the practice room daily, but it’s also great for recording liver performances, lessons and anything else you want recorded. For me, headphones in the practice room are a necessity. I practice with these Bose Soundsport Bluetooth headphones in my ears every day. Since they are wireless, I have the freedom to move around the studio as I want. No wire to get tangled up with my neck strap. Because they are sound isolating, they reduce the volume that’s coming into my ears. Before I started using Bluetooth earphones, I played wearing custom fit earplugs to prevent damage to my hearing. Now the headphones provide a dual function. I can listen to my metronome, tuner, music or backing track while practicing and protect my hearing. This is a serious professional instrument that is also like having a really cool toy to play with at the same time. EWI stands for electronic wind instrument. There are a couple other companies that make a version of this instrument, but for me the AKAI is the best. The EWI USB version is cheaper but has a few limitations. It plays less of a range, and needs to be connected to a computer or ipad for the sounds. 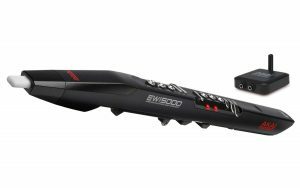 The EWI 5000 is a complete stand alone instrument that just needs to be plugged into an amp or sound system to be heard. There’s even a headphone jack and wireless capability. The AKAI EWI is the sort of thing all sax players want, but have trouble justifying the purchase. Make someone feel like a kid again with one of these. Where’s the Saxophones and Mouthpieces? I purposely left out saxophones, mouthpieces and reeds from this list since those items are highly personal and should really be chosen by the player themself after trying them out. These gifts work all year long. birthdays, father’s day, mother’s day, Christmas you name it. If you’ve got any ideas for other great gifts for saxophone players or something on your own wish list, please share in the comments below. I’m always looking for new saxophone gear and accessories. How’s going Jay.. you’re my music teacher so I do pretty much whatever you say..I bought a TWO1 ,reedgeek ,saxholder, deflector, Van Doren reed case and now a need your recomendation for an every day/gig tenor case..do you have any suggestions?? Haha… that’s all great gear good for you. My favorite cases are made by Bam. I have the hi tech case for tenor which is great. Anything from them is an excellent case though.